If for some reason you didn’t know Charlie Nowkawalk was an Inuk upon meeting him, a brief ride in his car would make it evident. A loose shotgun shell bouncing around on the dashboard while he drives around Inukjuak, Quebec might tip you off. But the clincher would probably be the half-finished soapstone carving sitting under the passenger seat. “Carving, that’s how I relax,” Nowkawalk says pulling up to his home. Bounding out of his car, the 51-year-old heads inside to discover that his two boys have friends over. It’s lunchtime, and Nowkawalk grabs a half-carved hunk of beluga out of the fridge along with a large helping of boiled cod. After telling the boys to wash their hand in Inuktitut, Nowkawalk lays out some cardboard on the floor. He grabs a piece of whale meat off the platter and begins to trim the fat. The boys are also given knives as Charlie shows them how to best separate the “muktuk” from the fat. Lunchtime at Charlie Nowkawalk’s house is about more than eating. It’s also an occasion for teaching youth about how to be Inuit. “We have a unique culture, a unique language, and even though they’re going to school down south, I find it really important for them to have their history, their historical background within them, so it can be a part of who they are,” says Nowkawalk of his children, Sam and Joseph. But Nowkawalk isn’t just concerned with showing his boys the ways of his ancestors. Since 2001 he’s been deeply involved in teaching many young men traditional Inuit knowledge through Inukjuak’s men association, known as Unaaq. This past winter Unaaq was awarded an Arctic Inspiration prize of $500,000, which will allow them to continue their work with Inuit youth. Work that was born out of particularly difficult time in Inukuak’s recent past. “We had very bad experience in Inukjuak where we lost young people from suicide,” says Nowkawalk. Inukjuak is an Inuit community of about 1,600 located in the subarctic region of Quebec known as Nunavik. With its rocky foothills leading to a river that flows into Hudson’s Bay, Inukjuak’s natural beauty is most evident in the summer. But the community also has an ugly side. In 2017, a 17-year-old boy was also charged with murdering a 14-year-old girl. That same year, Inukjuak had about 1,200 criminal incidents, including nearly 300 assaults and 69 sexual assaults. “Substance abuse, it’s hard because it’s alive and well up north,” says Sarah Lisa, who works in substance abuse prevention in Nunavik. Aside from alcohol, Lisa says cocaine and a new potent drug called “shatter” (a kind of cannabis extract 8-9 times stronger than marijuana) are being used frequently in Inukjuak. She says addiction issues became rampant in the 50’s and 60’s after historical traumas such as forced relocation, residential schools, and the slaughter of over a 1,000 sled dogs by the RCMP. “The men, that was their livelihood, that’s how they hunted that’s how they supported for their families. After that had happened, many of the men were broken,” she says. As a longtime member of Unaaq, 42-year-old Tommy Palliser says Inuit are still healing from trauma. He believes in order to not fall into the same cycles of abuse, youth need guidance. “There’s a gap between the generations that we’ve realized, say a knowledge gap, of traditional knowledge that’s partly from the school system that’s taking a lot of their time, teaching a different culture, teaching a different subject,” Palliser says. 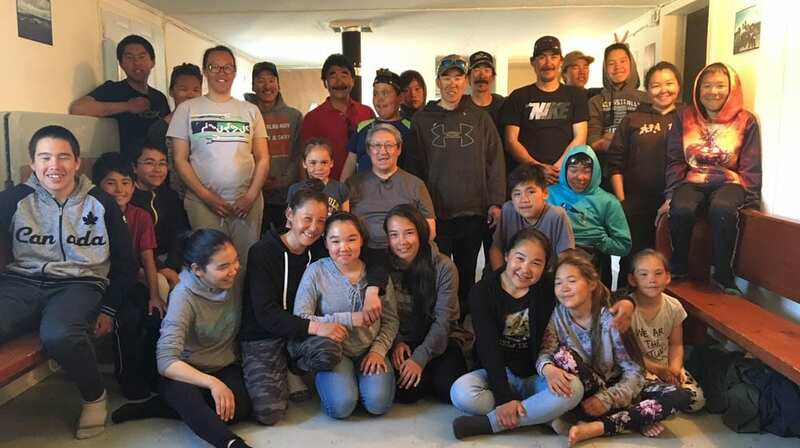 This summer nine Inuit young adults are working with elders to build an umiak, a traditional boat used to transport large mammals after a hunt. In the case of the umiak, ropes are used to attach the frame rather than nails so the seal skin exterior will not be pierced. Palliser says the project goes beyond passing down traditional knowledge, it also teaches these young men carpentry. Allie Aculiaq, 24, says he’s enjoying his summer job here and that it keeps him out of trouble that many of his peers fall into. 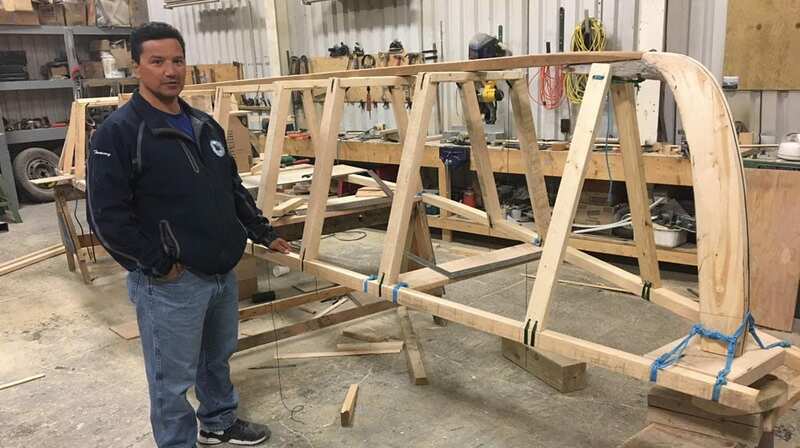 “Cause there’s nothing to do in town, that’s why they’re [Inukjuak youth] more into drugs, but Unaaq is helping a lot to avoid those things,” says Aculiaq. For his part, Palliser would like to network with other men’s associations in order to learn from each other’s mistakes and successes. 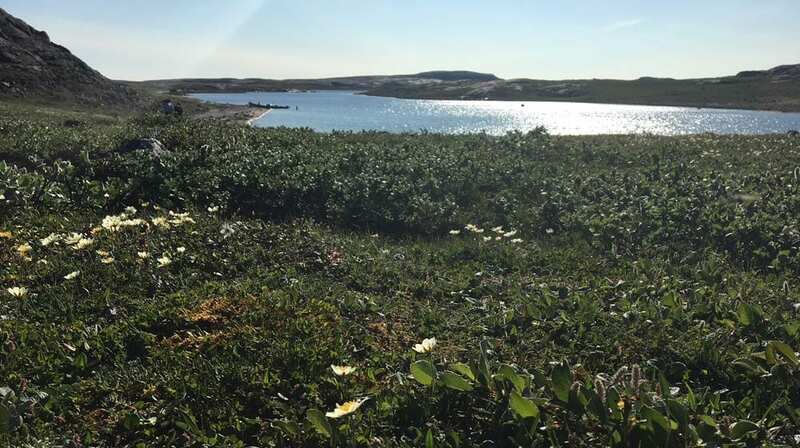 “I think there’s potential for work between the Inuit of Nunavik, Nunatsiavut, the Dene out in the west, the Mohawk in the south, we all have tradition and culture and language that we would like to preserve,” says Palliser. Meanwhile, Charlie Nowkawalk and his boys are taking a boat out to Unnaq’s youth camp. 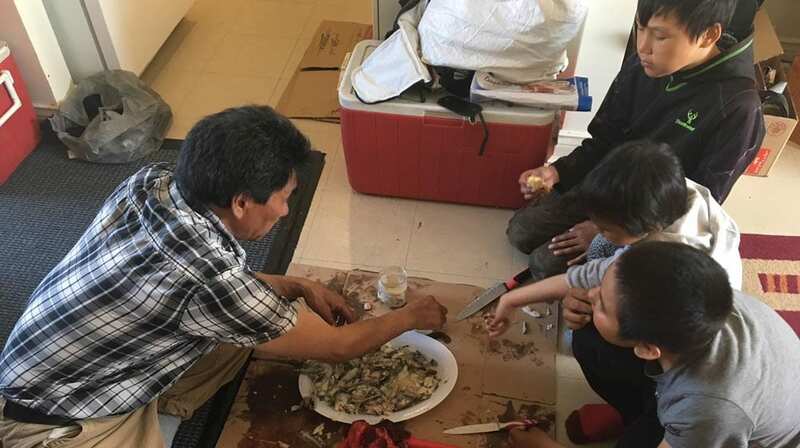 Perched up on a hill from about a 45-minute boat ride up river, the youth camp is a refuge from the bustle of town, where adolescents from Inukjuak come for days at a time to learn how to hunt and fish. Over the course of the afternoon, the kids dry their own freshly caught arctic chair before enjoying the fruits of their labour by eating it in bite-sized chunks right off the skin. An elder was also brought in to speak to an attentive audience of about two dozen children. While Saumik Iqalmuk mainly told his best hunting stories, he also speaks about being one of the 87 Inuit known as the “High Arctic Exiles” who were forced to relocate in the early 1950’s by the Canadian government. Being just a child at the time, he says the move from Inukjuak to Resolute Bay, Nunavut didn’t affect him so much – but that the same cannot be said of his parents. 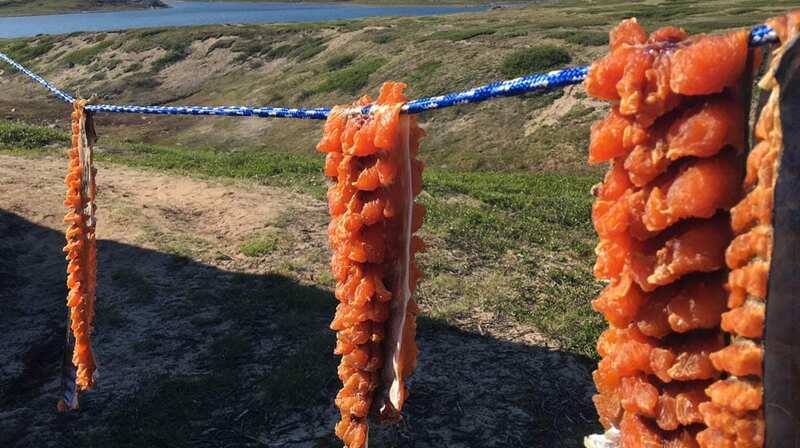 “For the adults who relocated from Inukjuak, there were many hardships because the animals to catch up there are mainly big game and not the small game that they are used to hear in Quebec,” says Iqalmuk in Inuktitut. After Iqalmuk’s talk, a game of baseball breaks out. And while it may not be a traditional Inuit game, Nowkawalk cheers along fervently while watching Inukjuak ‘s future learn about hustle, fair play, and teamwork. 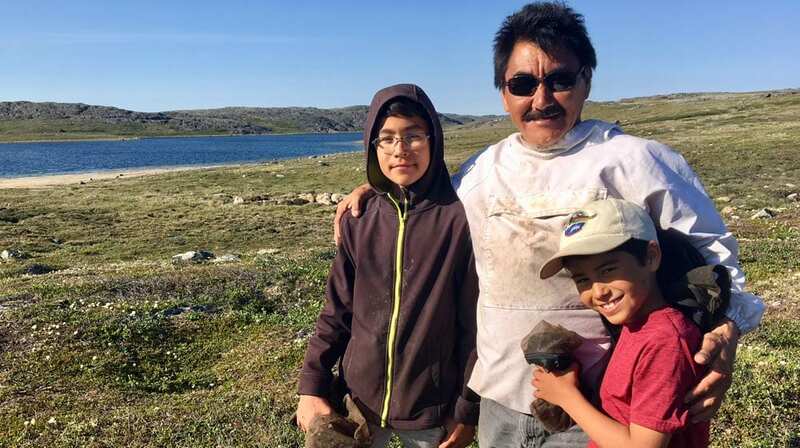 “We’ve been taught that men are the head of the family since a long time, but it takes both men and women to work together in order to have healthy communities,” Nowkawalk says before heading back to the boat with his boys. Neither Nowkawalk nor anyone else from the Unaaq Association expects their work to be a quick solution to the problems that ail Inukjuak. Yet in the long term, they feel the teachings of the past will ultimately forge a better future… one young Inuk at a time. 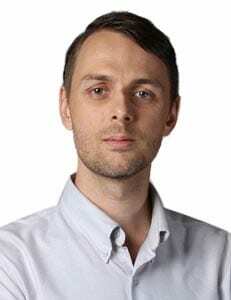 Tom Fennario is a correspondent for APTN News who works in the Montreal bureau. They are improved more since they started at the beginning they still do.